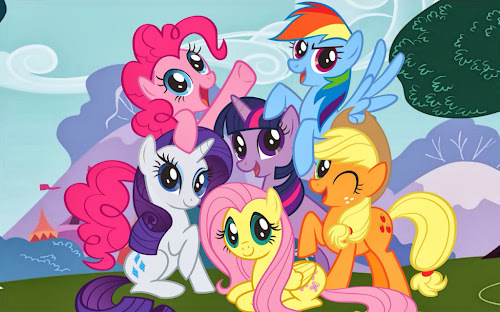 If you've spent much time with me in person, you probably know that I am a big fan of My Little Pony: Friendship is Magic. It helps that I have a nearly four-year-old daughter (holy crap!) but honestly, I'd watch it even if she wasn't around. It's adorable, hilarious, and completely without cynicism. There are very few shows aimed at little girls that don't make me grind my feminist teeth, and while MLP isn't perfect, it's pretty close. 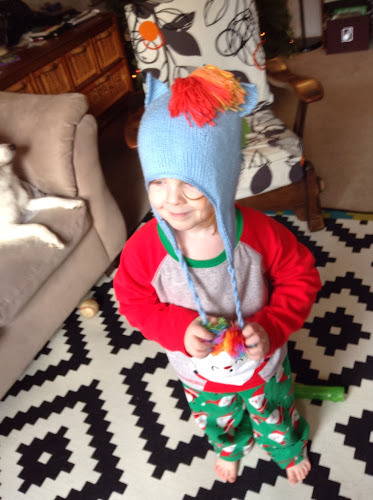 For Christmas I made my daughter a pony hat. Not just any pony hat, either. 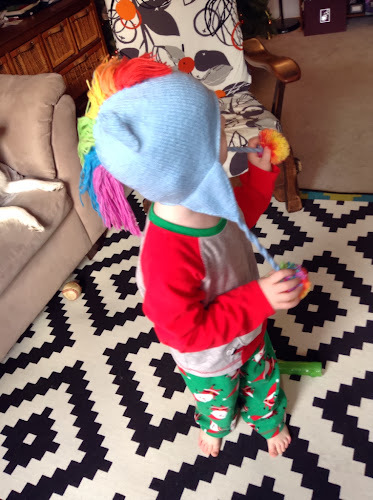 A Rainbow Dash hat. Because clearly she needed one. 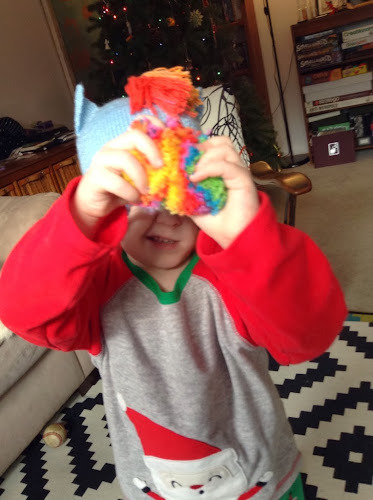 Sorry the photos are a little sloppy - it's not easy to keep a child still on Christmas morning. 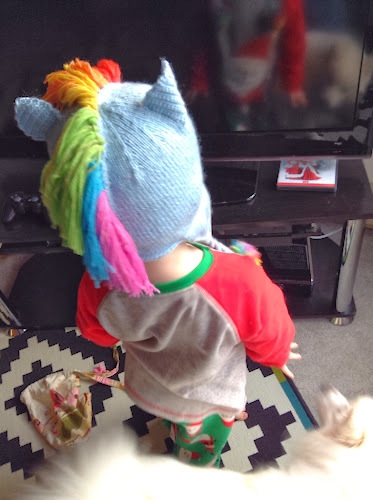 While I improvised the entire project (I have been doing that a lot lately) you could easily modify any hat pattern to be a super awesome pony hat. I made the mane by finding the centre line of the hat and tying small bundles of yarn every few stitches. For the ears I made simple single crochet triangles, picked up along the crown of the hat. You could also knit them and sew them on, or make them from felt. The pompoms were the perfect touch. 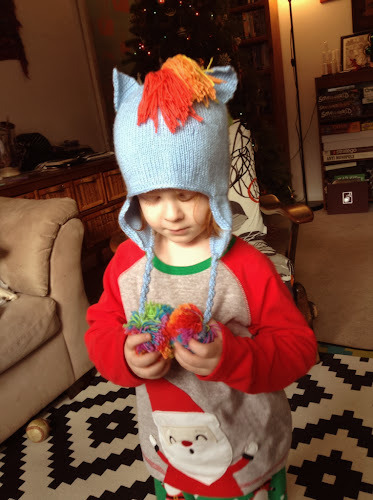 Both the mane and the pompoms were made from Knitpicks Felici self striping yarn. It was much cheaper to buy one ball with all the colours I needed than shell out for all six colours separately. The body of the hat is Knitpicks Brava Sport. It's a fairly pleasant acrylic to work with, though I did find it squeaky. Can't beat the price though! Isn't it cute? I made it big enough that it almost fits me, so she'll be able to wear it for as long as she's interested in ponies!